Former Peterborough Town all-rounder Rob Sayer has won Leicestershire County Cricket Club’s young player-of-the year prize for 2016. Sayer (21), who played for England in an under 19 world cup, broke into the first-team this season, making three first-class appearances and five appearances in the domestic T20 blast. Sayer’s progress has been good enough to earn him a winter in New Zealand where he will develop his skills as an off-spinner with former Kiwi Test player Jeetan Patel. The posting is made under the ECB Overseas Placement programme and Sayer, from Ramsey St Mary, is one of just nine English players to be selected for this winter. Sayer learnt his cricket originally at Upwood CC and was a star player for Hunts in his teenage years. And the next set of star young Hunts cricketers are off on tour to South Africa later this month. 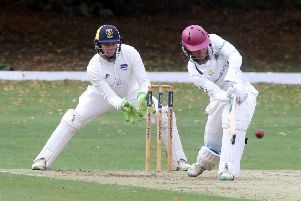 Three current Peterborough Town players have been selected, They are batsman Kieran Judd, who broke into Town’s Northants Premier Division side this summer, and bowlers Thomas Sanderson and Connor Parnell. Barnack seamer Robert Best, Nassington’s precocious left-arm slow bowler Harrison Craig, Castor bowler Stuart Dockerill and Ramsey pair Mark Saunders and Ollie Stevens are also included in an under 19 squad that will be managed by Ian Cousins and coached by David Summers. The team will play six matches against some of the top school and junior club sides in the Pretoria and Cape Town areas. They will also visit the Mbekwent Township near Paarl where they will interact with local school children and deliver a coaching session. Oundle School student Simon Fernandes (16) was picked for the MCC Schools squad to play England Schools in their annual match at Lord’s recently. Fernandes was 12th man but entered the field of play to take a catch.